Dr. Mike Robinson, host of 3 Questions interviewed Robert Strupp, Esq. Executive Director, Baltimore Neighborhood, Incorporate regarding the potential link between fair housing violations and zip codes. 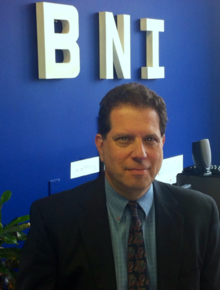 Robert Strupp is Executive Director of Baltimore Neighborhoods, Inc. (BNI). As Executive Director, Mr. Strupp oversees day-to-day operations of the organization, including strategic, programmatic and financial planning, working for housing justice through fair housing and tenant-landlord initiatives. One of the oldest fair housing agencies in the nation, BNI is a 55 year old statewide non-profit committed to the advancement, understanding and enforcement of fair housing and tenant/landlord laws. BNI provides impartial tenant/landlord guidance and promotes housing justice throughout the State of Maryland. Mr. Strupp is a frequent speaker and serves on numerous local, state and national coalitions and committees focused on housing issues.Before becoming executive director of BNI, he was Manager of Systemic Investigations at the National Community Reinvestment Coalition (NCRC), where his work focused on initiatives designed to promote policies and practices that prevent housing discrimination and strengthen enforcement of fair housing and consumer protection laws. Previously, Mr. Strupp served as the Director of Research and Policy with the Community Law Center (CLC) in Baltimore City, where he worked to combat predatory and deceptive real estate practices. Mr. Strupp was an early catalyst for improved enforcement and an advocate for new laws to reduce scams and protect consumers from dishonest mortgage lending and deceptive residential property transactions. He has served on numerous real estate workgroups and chaired a state-wide enforcement committee, bringing together regulators, public officials, advocates, funders and others concerned with residential real estate. Mr. Strupp represents has served as a member of the Consumer Advisory Council of the American Association of Residential Mortgage Regulators, and serves on the board of the Community Law Center. Mr. Strupp holds a JD degree and is licensed to practice law in the District of Columbia.